I'm posting this more as an open question than a statement of my own opinion, so comments appreciated! A new paper out in Paleobiology by Verracchio et al. describes the porosity of Troodon formosus eggs and uses the data as evidence to support the hypothesis that troodontids brooded their eggs, like modern birds and other known maniraptorans, rather than burying them, like crocodilians and some other modern birds. In and of itself, this conclusion is interesting in that it pretty much solidifies nest brooding (as opposed to burial) as the ancestral trait for modern birds, and for maniraptorans (or at least chuniaoans*) in general. Study coauthor Darla Zelenitsky with Troodon formosus nest. Photo by Jay Im, University of Calgary. I hate to admit it, but my first thought when reading the headline of this news article from PhysOrg was that, yeah, we all assumed that anyway. The unspoken "rule of cool" is that science tends to be more exciting when we find evidence that contradicts previously well-supported hypotheses, rather than confirming hypotheses we all took for granted. Sure, finding the Higgs-Boson was exciting, but not nearly as exciting as not finding it, which could have led to new physics. I assumed, and I'm sure many others did as well, that troodontids brooded their eggs, based on the reasonably secure hypothesis that oviraptorids (which are known to have done so) are more basal. This behavior in troodontids was even depicted nicely in 2011's Dinosaur Revolution. So score another one for phylogenetic bracketing! Arctic troodontids, anatomy based on Troodon formosus. Matt Martyniuk, all rights reserved. Aside from all that, the assertion in the PhysOrg headline struck me as particularly meaningless. How could a study of troodontid brooding lend support to the dinosaur/bird hypothesis? This statement would have been accurate a decade ago, but not today. The reason is the moving goalposts of the dinosaur/bird opposition. by Matt Martyniuk. All rights reserved. 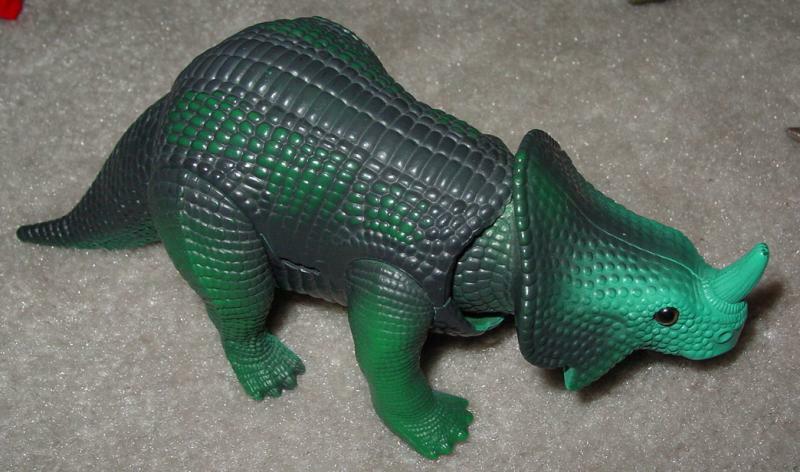 Monoclonius crassus is an iconic ceratopsian, a fixture of many 1970s era dinosaur books, which owes its status almost completely to another species. I grew up with depictions of Monoclonius in media like Phil Tippet's short film Prehistoric Beast and toys like the DinoRiders figure. Like most representations of Monoclonius in popular culture, these were based on specimens now classified as Centrosaurus apertus (though, actually, that DinoRider looks like it has a genuinely Monoclonius-type frill, long, straight, and unadorned). Originally known only from teeth and a fragmentary frill and nasal horn, the Monoclonius was one of the first ceratopsians known to science, found by E.D. Cope in 1876 and named for its configuration of tooth roots ("single sprout" as opposed to the "double sprout" of Diclonius, now known to pertain to a hadrosaur). Like many of Cope's species, Monoclonius was not recognized for what it really was (a "horned dinosaur") until more complete remains from other ceratopsians likeTriceratops were found by Cope's rival O.C. Marsh. Monoclonius itself remaned enigmatic for many years, though the idea of a Triceratops-like ceratopsian with a single large nasal horn was used by Charles R. Knight in his famous painting of Cope's other dubious ceratopsian, Agathaumas. Knight also incorporated spiny dermal armor associated with some supposed Monoclonius remains, though at least some of this material was later shown to belong to ankylosaurs and pachycephalosaurs. Monoclonius became iconic when complete skeletons of ceratopsians were found in the Judith River/Dinosaur Park Formation of Montana/Alberta. In the early 1900s, C.H. Sternberg (who had co-discovered the orgiinal Monoclonius fossils with Cope) established that complete specimens classified by Lawrence Lambe as Centrosaurus apertus (and some of which were considered to be Monoclonius and which had already been used to form a picture of that animal) were a distinct species. After this, the genus Monoclonius was dismantled, with former specimens re-assigned to either new or recently established centrosaurine genera. Matters were complicated by the discovery of the drastic changes centrosaurines went through as they grew, and today the distinctive Monoclonius specimens are generally considered juvenile centrosaurines. Zach Miller has done an awesome rendering of a centrosaurine growth series showing where a traditional "Monoclonius" specimen fits into the sequence. parietal frill. Incipient styracosaur-like spikes? However, known specimens of Monoclonius aren't a perfect match for juveniles of the contemporary Einiosaurus, as Miller notes. 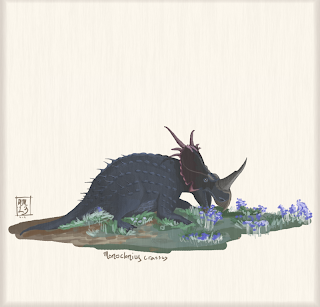 The long, generally flattened frill with larger incipient spikes at the first three positions of the the parietal (Ryan 2006) are reminiscant of Styracosaurus and Einiosaurus, all of about the same geological age. The large size of a specimen sometimes referred to the distinct species Monoclonius lowei compares with some pachyrhinosaurs like the contemporary Achelousaurus, and while these do begin life with a small nasal horn that later develops into a boss, and though it isn't backward-cureved, such drastic changes during ontogony are known in other ceratopsians. It may be that Monoclonius is a juvenile form of (and therefore a senior synonym of) one of these centrosaurines, or it may be a valid species similar to both, possibly a transitional form between centrosaurin-type centrosaurs and pachyrhinosaurs. Ironically, though long mixed up with that genus, Monoclonius doesn't seem to be as great a match for Centrosaurus itself. In my restoration of a hypothetical, mature Monoclonius (above), I made it generally styracosaur-like, though with more einiosaur-like parietal spikes, and these could alternately be seen as styracosaur parietal spikes which are not yet fully grown. In this way I've tried to hedge my bets: this Monoclonius could either be a mature, intermediate stage between styracosaurs and einiosaurs, or simply an immature but very large styracosaur. The nasal horn is restored as styracosaur-like as well, a conservative growth trajectory for the shorter, recurved nose horn seen in subadult specimens of M. crassus and M. lowei. However, it's entirely possible that as the nasal horn grew, it swept forward into the hook-like horn of Einiosaurus or even flattened and thickened into the nasal boss seen in Achelousaurus. 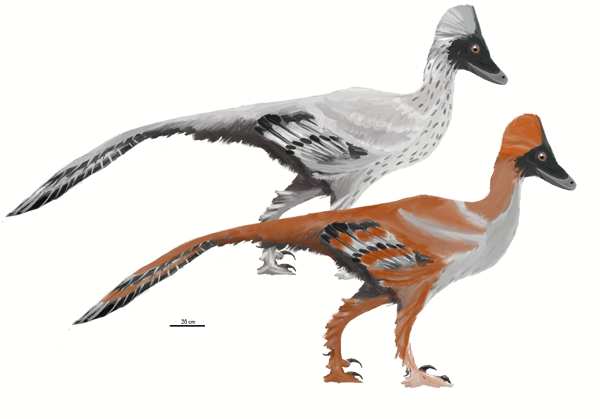 Both of those pachyrhinosaurs have long parietal spikes like Monoclonius seems to have had, though both only had a single pair jutting from the back of the frill, while Monoclonius seems to have been developing at least three. Though, again, it's possible the transformation was more extreme than I'm assuming for my illustration, and that these incipient parietal horns were resorbed during growth like the epiparietals of chasmosaurines (e.g. Triceratops). Rather than the centrosaur-like Monoclonius of my childhood, it looks like this fairly plain-looking ceratopsian grew up into something a bit more spectacular. But we'll need further study and, hopefully, more specimens to find out exactly what, and exactly how extreme, that transformation may have been. * Ryan, M.J. (2006). "The status of the problematic taxon Monoclonius (Ornithischia: Ceratopsidae) and the recognition of adult-sized dinosaur taxa." Geological Society of America Abstracts with Programs, 38(4): 62.